Here is another polish I really like. It's part of the OPI Swiss collection (Fall 2010). I have often viwed this polish swatched as blue but in reality it's much more teal (remember the name of the polish ;D), a creme teal. It's very shiny even without a top coat. I tried then to add a crackle polish on it. The name of this one is Pink Bite (IsaDora). 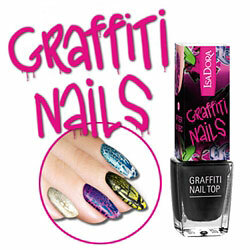 IsaDora (Sweden brand) has released some very nice and fun crackle polishes, wich are called "graffiti polishes". The crackle polishes are the following: "White Art" (withe), "Masterpiece" (bright pink), "Yellow crew" (yellow), "Spraycan Blue" (dark blue), "Black Tag" (dark green). Recentyl new colors were released: "All City Brown" (dark brown), "Latte Queen" (beige), "Blue Burner" (light blue), and "Pink Bite" (very soft pink). I bought "Latte Queen" and "Pink Bite". Here I tried "Pink Bite" over OPI "Ski teal we drop". They are my first shatter/crackle polishes. I was very sceptical about crackle polishes but after seeing many swatches on the net, I've started to like the patterns they allow us to show on our nails! So I deciced to try and this is very funny and pleasant to do! Ski Teal We Drop looks gorgeous, I never picked up anything from this collection and I kick myself for it all the time! Wow...this is such a pretty combination and looks so totally unique! I love it! Ha, I totally lied. 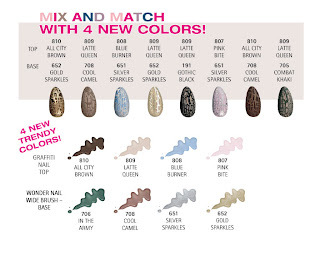 I did pick up one color from this collection, Lucerne-tainly Look Marvelous. I love that color. I really want Glitzerland now and I have no idea why I didn't get it back when it was easy for me to get.